Due to phenomenal demand for tickets and with more dates still to be added Buddy - The Buddy Holly Story has announced it will play at least an additional 23 theatres in 2017, extending the autumn 2016 tour which opens at Harlow Playhouse on Wednesday 31 August and arrives at the King’s in Glasgow from Tuesday-Saturday 8 April 2017. As we approach Wednesday 7 September, Buddy Holly’s 80th Birthday, Buddy - The Buddy Holly Story tells the enduring tale of the musical icon’s meteoric rise to fame and his final legendary performance at the Surf Ballroom in Clear Lake, Iowa, before his tragic and untimely death at the age of 22. In 18 short months the Texas-born boy revolutionized the face of contemporary music influencing everyone from The Beatles to Bruce Springsteen. 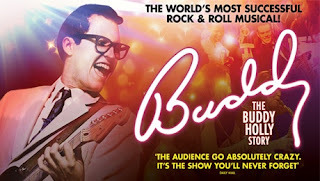 The production boasts a phenomenally multi-talented cast comprising of Glen Joseph and Alex Fobbester (who alternate the role of Buddy Holly), Miguel Angel, Joe Butcher, Celia Cruwys-Finnigan, Jordan Cunningham, Josh Haberfield, Kerry Low, Thomas Mitchells,Matthew Quinn, Tom Sowinski and Alex Tosh. Together they present two terrific hours of music with over 20 of his greatest hits, including the timeless classics That’ll Be The Day, Peggy Sue, Oh Boy and Rave On. With the Big Bopper’s Chantilly Lace and Ritchie Valens’ La Bamba completing a stellar musical line-up, Buddy is a not to be missed evening of family entertainment. Although there have been many imitations Buddy - The Buddy Holly Story has stood the test of time. The show has inspired a generation of multi-million selling juke-box musicals, including Mamma Mia and We Will Rock You, still remains a true original and a musical phenomenon. Seen by over 22 million music fans since it opened in London’s West End in 1989, Buddy speaks an international language and continues to have audiences from aged 8 to 80 years old rockin’ in the aisles across the globe!